With every space of the house being filled with various objects, it seems almost impossible to have space to store everything. People, thus, were pressured to innovate and considered the space beneath the bed as a suitable storage location. If anything, this is a smart design that can serve as a stand-alone storage space or as a complement to a house saturated with clutter and clutter cabinets. 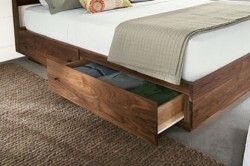 Underbed storage are very useful especially with quick storage needs. If a person, for example, were to have guests in their room while everything is in disarray, he or she merely has to stuff all the clutter in the underbed storage for temporary safekeeping in order to order to look presentable. Accordingly, underbed storage can also be used to store objects that need easy access to. My son, for example, who plays X Box in his room, keeps all his gaming paraphernalia in the underbed storage. My younger daughter, on the other hand, keeps her doll collection in her underbed storage so that she can play with them whenever she feels like it. I use it to store my clothes and other accessories. No one would ever assume that these underbed storage are what they indeed are because they look so naturally situated within the side frames of the bed. A person who has no notion of such a compartment would never know what it is the first time they’d see it. Manufacturers take the extra effort to make it appear as much a part as the whole bed so that it would create the illusion of being mere wooden planks. The best part about these storage spaces, however, is that they can be secured with lock and key, so that you can keep your valuables without the fear of anyone browsing through them wantonly. A double bed with underbed storage may be sufficient to store all your clothes under your bed, instead of putting them away in a cabinet intended for that sole purpose. With such a set-up, you’d be able to free your room of unnecessary furniture and have your clothes nearby whenever you need to change. Accordingly, books can also be stored in your underbed storage, thereby taking away the need for bookshelves in your room. That way, you can continue to read your novels before you sleep just by reaching underneath your bed. As you can see, underbed storage goes beyond just the mere act of storing common household objects because it makes rooms less crowded by rendering the corresponding furniture that houses these objects futile. Imagine everything you can do with the free space in your bedroom, or how freely you can move around because of it. To ensure you get the best type of underbed storage available, I suggest the Espresso King Size Captain Platform Storage Bed from Amazon. It is a sturdy bed with a handsome darkwood finish, complete with underbed storage plus some other secret interior compartments. Order today and forever change your notion of storage space with underbed storage.